Rather uneven sketching this month, but then that's always true. 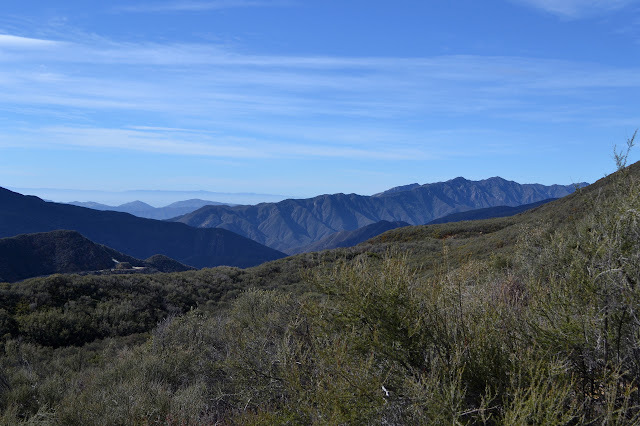 One from the western ridge of Arroyo Hondo. A spot among oaks for lunch on Baron Ranch. Looking down the valley toward the islands on Baron Ranch. Just before things got noisy at Baron Ranch. Taking in the grass lake on Dry Lakes Ridge. The good: You get to go into a wonderful area. Sweet Piru is flowing nearby. That's a creek that holds great promise of adventures. The bad: The actual area you go to has had people working very hard to make it somewhat less than wonderful and you don't get to wander around very much. The indifferent: Looked like there was a ranger waiting to close the gate as we left. Indifferent because the gate at Piru is already closed and bicycles still work on all those roads. The route up Dry Lakes Ridge cannot properly be called a trail. It is a well trod use trail up a wide fuel break. 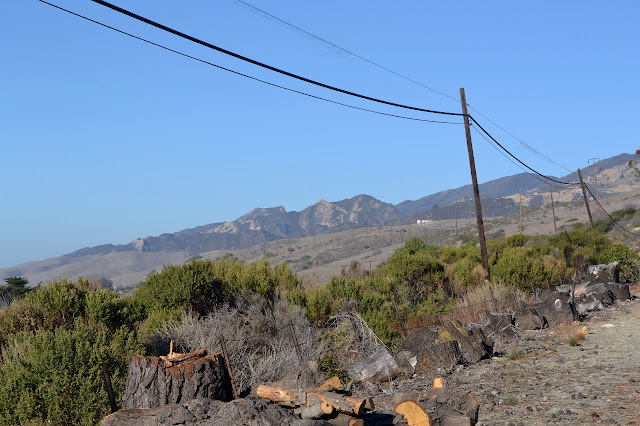 As such, it is actually a network of intertwined routes that meander across a wide swath along the ridge edge. Occasional false routes spread out from it to viewpoints or for explore a ridge branch or forming dwindling downhill routes or all of the above. It can be a bit of a mess, but while it is easy to get a little wrong, it is hard to get it a lot wrong. A turnout on the left and a second on the right bookend the start of the trail with ample parking. There is no sign, but it is just a bit over a mile from the turn to Rose Valley when headed north. I can see the trail to my left as I pass the intersection, just past a nearby hill, so know where to aim. It is empty when I get there. Crossing into a gully and starting up the steep hill, there are numerous footsteps and a few of them very sharp and fresh. The start of the trail passes through a small drainage and then climbs directly up the hill toward the ridge line. After a brief pause, the trail gets steeper, which doesn't seem possible. It's quite a trudge of careful climbing and a little warmer than I'd wanted. 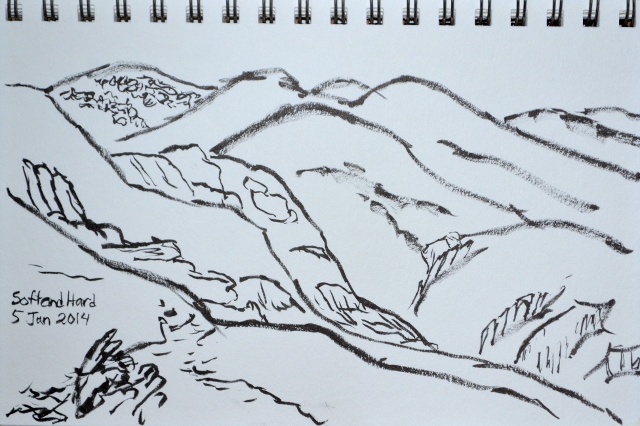 After about 700 feet, the slope mellows out to something very reasonable and the views are outstanding, or at least starting to be. 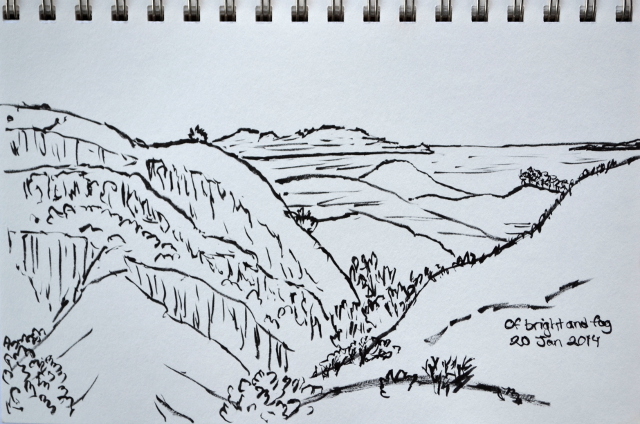 Starting to get views into the Sespe. A little bit of fog out over the lake. 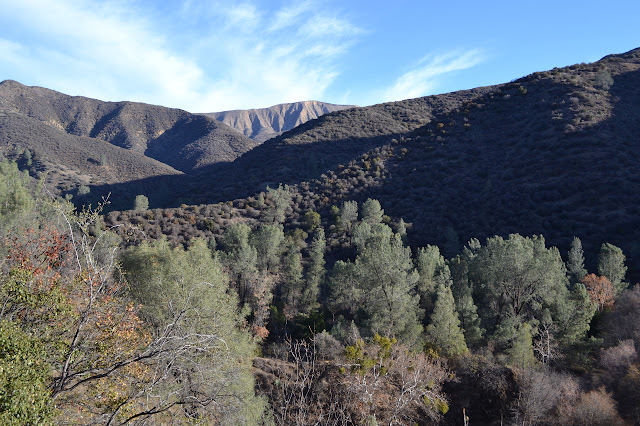 There seems to be an effort to check off the area trails, for this week I join the group from the Sierra club evening hikes as they return to NIRA, but this time head upstream along the Manzana. Nine year old me remembers that this area can have difficult to follow trails when it gets into the creek, so why not hit it with a guide? Also, I'll get to try to compare the slightly further areas with those memories. With twenty-seven years and a fire to change things and fade memories, I'm unlikely to sort things out. Still, the game must be played. As we start, the old paved ford over a wide creek is gone in favor of narrower, rocky channels. It is completely dry and the white rocks seem like bleached bones in the sun even though it is cool and cloudy. The clouds don't look like they'll yield the much needed rain and I haven't even thought about bringing rain gear. 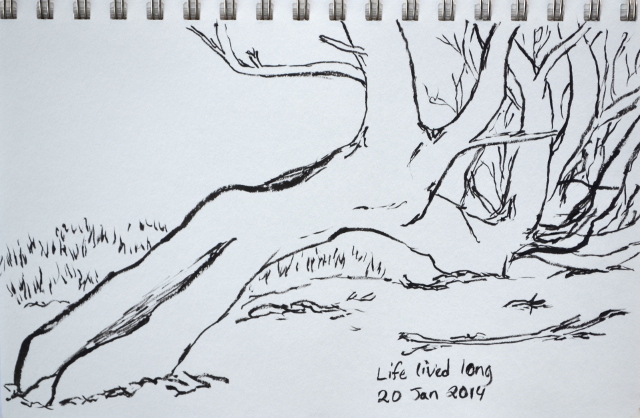 We sign into the register and start down the trail passing by an owl that seems to have simply fallen out of a tree. That was never there before. We stay to the low route on the way to Lost Valley, and even the character of the slide area along that route seems to have changed. It moved around, but there was always a very sketchy bit where the trail was all slide. Coming to Lost Valley, the sign for the junction is far above our route although it used to be perfectly placed. Of course, these are all changes I knew from hiking here in 2009. There is a route now that will come to this sign, but we stay to the straightforward route and miss it. We pass through Lost Valley Camp, which is marked by a flame cut sign and table and seems to get some use. Following the well established trail, we cross dry tributaries and get extensive looks at the dry river. The trail doesn't seem like something that could be easily lost, but as we follow along up on the side of the canyon, more trail can be seen below. 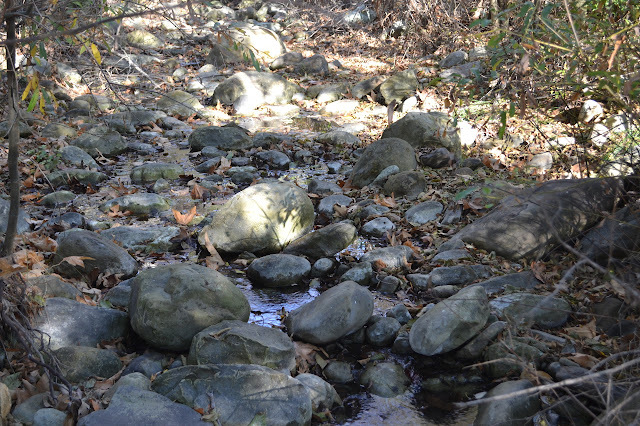 The trail below looks good at first glance, but more careful study shows that it disperses and collects producing a disjointed trail commonly found in creek beds. I'm sure at least some of my route as a child was along paths like these so that we would be following good trail then suddenly find it had vanished below our feet. Such travel is discouraging, so I'm happy to be up on the side this time even though it means extra climbs and drops. One tributary that forced us into a little bit of extra up and down. 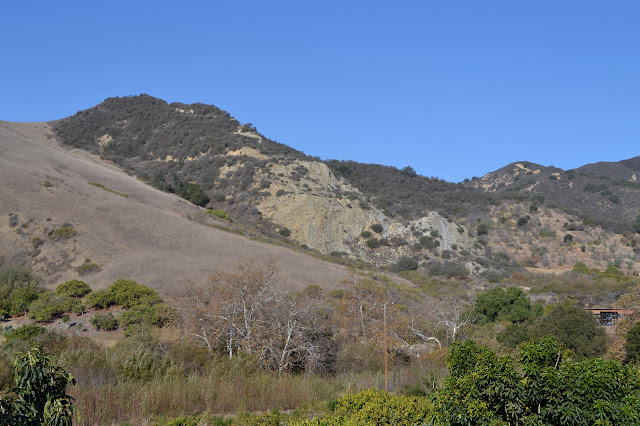 It looks like Lost Valley Trail curves around the hill in the distance. This trail is certainly an oddity. James Wapotich seems to have the most complete description of it. The southern half of the ranch is an orchard and special rules are in effect because of this. The trail is open to the public Saturday, Sunday, and Monday from 8AM to sunset as long as they are on foot and without any pets. 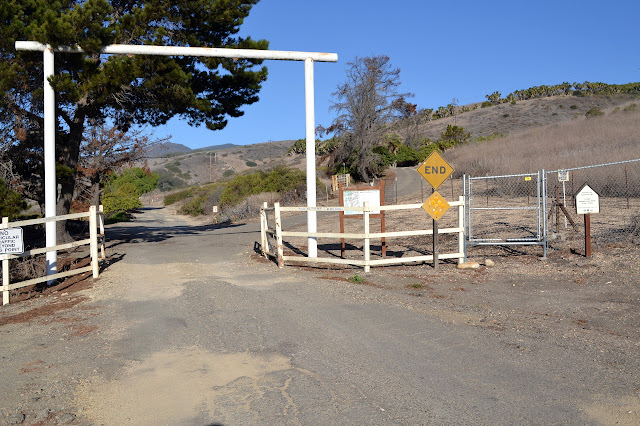 No bicycles, no horses, and no cars (belonging to hikers) are allowed past the gate. The trail is only seven or eight miles long total, so I figured I would have plenty of time to dally along the way and loaded up the GPS with cache locations to try geocaching out properly. Taking the right turn off the highway and a quick left onto the rough frontage road, I park at the gate and get the GPS going to find that I've already missed one of the geocaches associated with the trail. Really? I can't be bothered to go back for it, so the first one is at the trailhead. It turns out I can't be bothered to spend all that much time looking for something when getting on the trail beacons either, and the time spent is not enough. Hikers must stop at the ranch gate and hike in. The rules are enumerated to the right with a map of the trail. 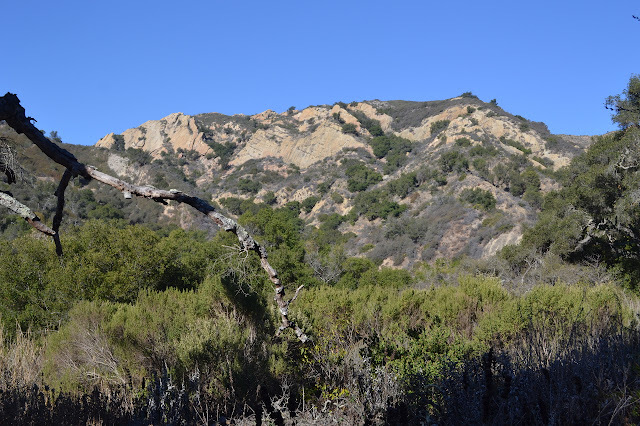 The hogback ridges on the far side of Arroyo Hondo can be seen from here. A blanket of fog sits far out on the ocean, but overhead it is sunny and clear. The start of the route is paved. Signs at every road junction point the way along the "trail" and indicate there is no entry along each "ranch road". They really don't want any confusion. The highway is often loud just a few feet to the side. With the GPS showing the map so that I'll know I'm near a cache by the arrow getting near a box, I find that the next cache is near the corner where the road turns away from the freeway and into Arroyo Quemado. 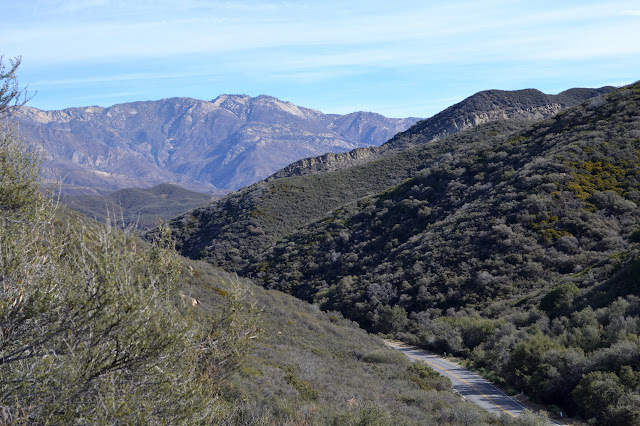 The freeway noise dwindles as the road drops into the canyon. The pavement ends at another gate and a mailbox with a thermometer (reading 44°F) and yet another cache. Somewhere. 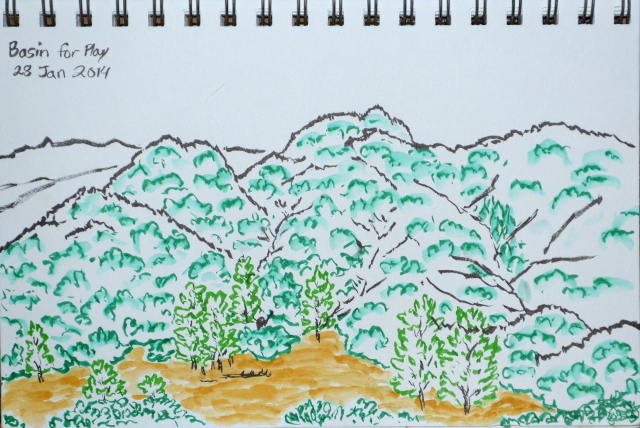 A little bit of the lower valley of Arroyo Quemado. While wandering up Romero Canyon in the dark as part of the Wednesday conditioning hike held by the local Sierra Club, I got an offer for a hike down to the Manzana Schoolhouse, something I've wanted to do but never quite got around to planning for myself. That could partly be because it is a little bit more than eight miles down to the schoolhouse and partly because this area can become quite blistering in the summer when the hours to do a long hike are easier to come by. The hike on offer didn't just go down the creek and back up, but would make a loop taking in the western section of Hurricane Deck, so is exactly the hike I would have planned. This does bring the total distance to a bit more than eighteen miles and adds some actual climbing to the otherwise very flat route. We start downstream from NIRA shortly after the 8AM meeting time, following the Manzana Creek to Potrero Camp. The trail along this section stays up on the side of the canyon and is in excellent shape. Starting down Manzana Creek on the canyon side trail, which can be seen ahead along the left side. 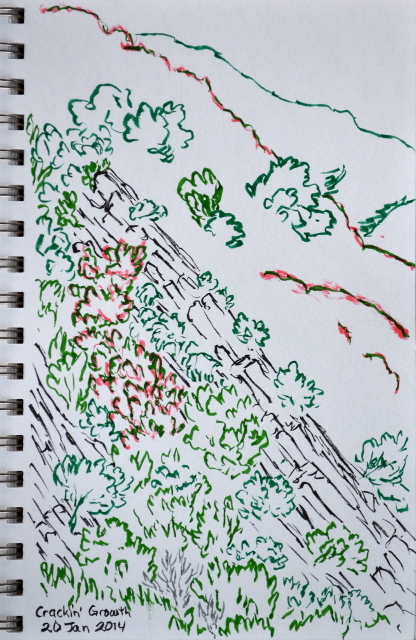 Hurricane Deck peeks out through Potrero Canyon. 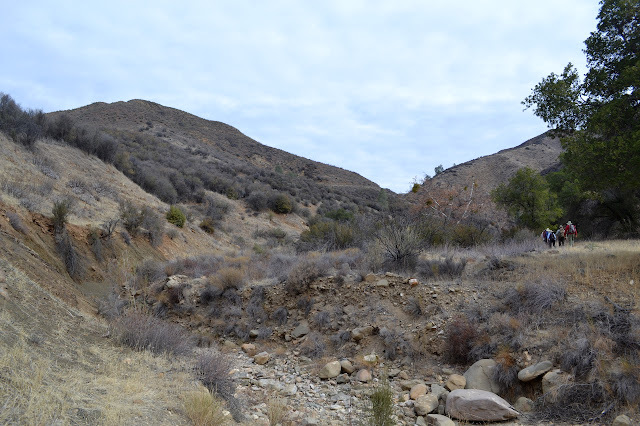 I decided that my next monument hunt would be around Arroyo Hondo where there should be two witness corners along the boundary of the forest. 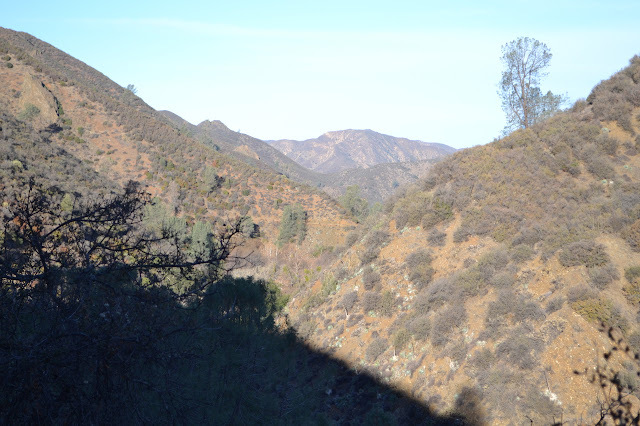 One is in the canyon at a wide spot and could be reached either by an abandoned trail up the canyon or an abandoned road at the end of Upper Outlaw Trail on the eastern ridge that comes down into the strike canyon to meet more abandoned trail. 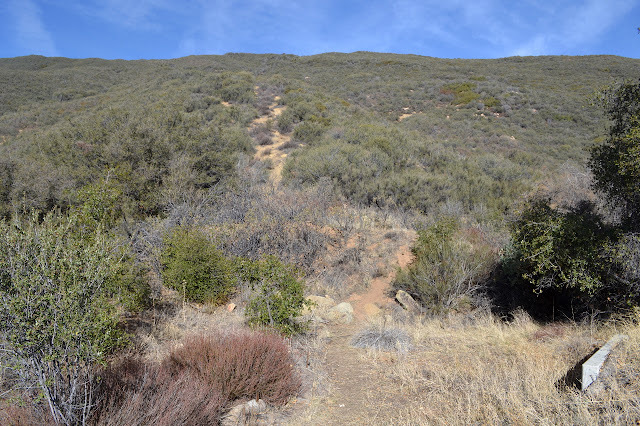 The second is up on the ridge to the west and can be reached by continuing up the abandoned trail to near its end or taking an abandoned road along the western ridge. The key to this is how abandoned these routes are. 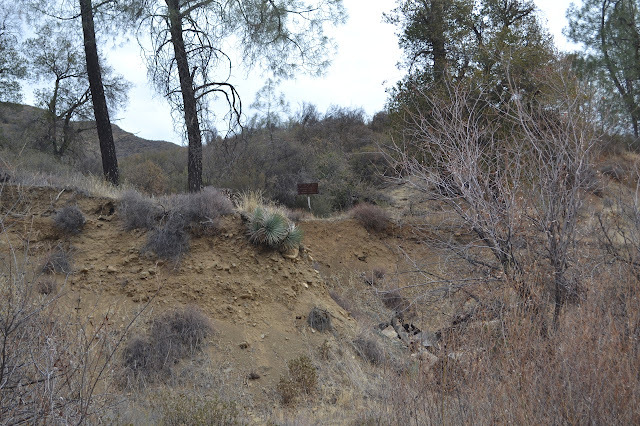 The first is just a little ways past where the trail is not abandoned via the canyon and has a structure marked a quarter mile into the forest to pique curiosity, so this looks like a nice one to start with. Going up the canyon, it looks like only a narrow spot just above where the trail is currently maintained is the only difficulty besides the unknown quantity of vegetation, so I'll take the easy route. Noticing the next open weekend was in a few days, I got permission to visit and thus find myself taking a hard right off the highway into the narrow driveway of the preserve and getting greeted by one of the happiest, friendliest dogs ever. Packed up and signed in and set up with my new trail spats (gaiters), it is time to get moving up the canyon. 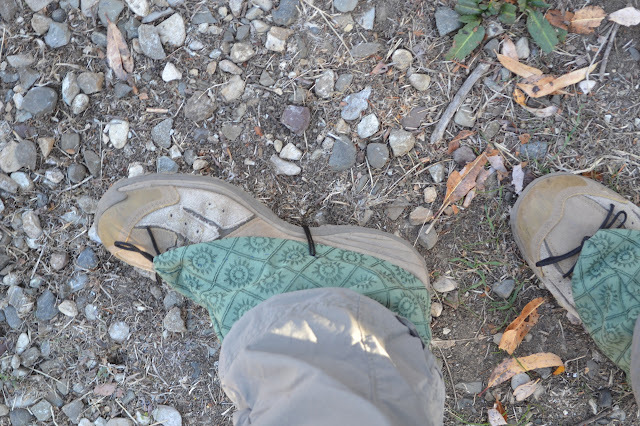 Some gaiters thrown together to try to keep the dirt out so my socks won't look like I've been walking through mud in them at the end of the day. There is water in the creek this time, at least in most spots. The rocks on the west side of the canyon.